What is the Impact Estimate? As a mission-driven organization, Texas Consilium measures our success based on the positive impact that we help create for our clients. The key financial measurements of that impact are (a) cost savings generated through elimination of waste, inefficiency and other profit leaks in your business; (b) top-line revenue growth; and (c) overall profit improvement created through the combination of growth and cost savings. 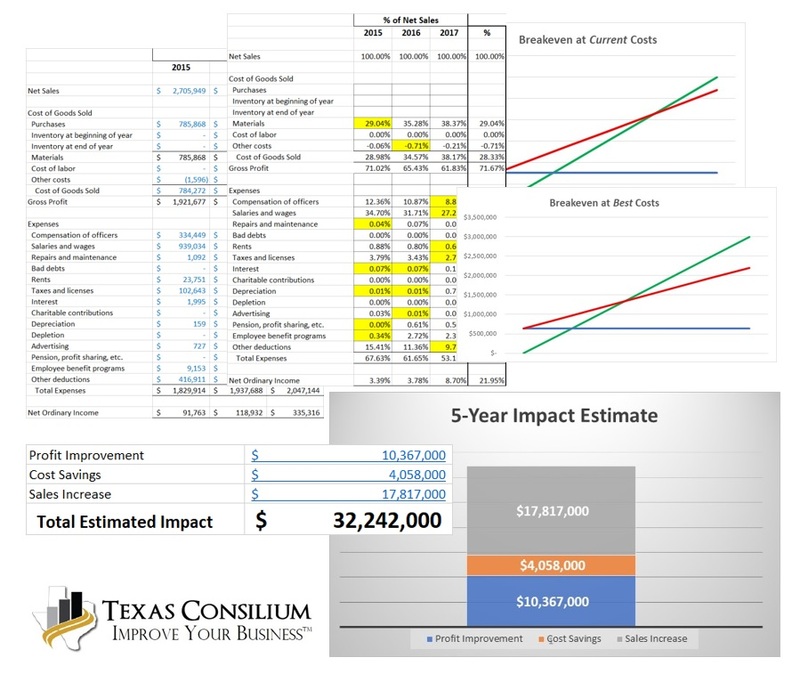 As a client acceptance standard, we require that the potential for positive impact that Texas Consilium can help create far exceed any investment by you that may be required to achieve it. The computed 5-year impact estimates for cost savings, revenue growth and profit improvement. We can then discuss and if appropriate, make adjustments based on our combined understanding of the environment in which you operate, and your vision for your business. Once we concur, this Impact Estimate is a powerful initial model for your business looking forward and it becomes the combined vision that we will be working together to achieve.